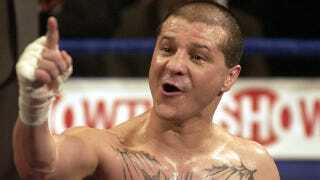 New Mexico police are saying that boxer Johnny Tapia was found dead at his house on Sunday. They do not suspect foul play. Apparently he was the victim of having been Johnny Tapia for 45 years. He won five belts in three weight classes during his career which is pretty good considering all the time off he had to take off on account of the cocaine. He fought very hard when he was fighting and that was always. The surprise for Johnny must have been to be declared dead and then to actually die. He is a gentleman who got to write in his autobiography two years ago that he had already been declared on four earlier occasions. Other times maybe he would have liked to have been. He saw his mother raped and stabbed with a screwdriver and chained to a truck which is more than any person especially a person of just 8 years old should ever have to see. He did drugs and he did time in jail but there are some debts that cannot be paid back. Like when his brother-in-law and nephew died in a road accident as they went to visit Johnny in the hospital five years ago after he took too many drugs. Dying must be a big event for Johnny as it is for everyone but it is not the first time he has died on a big day. He shot himself full of drugs on his wedding night and died not long after his bride found him but came back. There was a cocaine overdose that nearly made him dead another time. In his professional boxing career he built a record of 59-5-2. In his life he was 4-1 against death and that is really something too. If you were a fan of the sport of boxing he was the sort of boxer you always wanted to see beat the other fellow. Boxing makes people stand and yell because it is two people meeting to create a disaster for each other. People do not like to admit it but we all like to see safe disasters and feel a little more alive afterwards after our hearts pound and our stomachs dry out and our throats sand over. When a boxer like Johnny steps into the ring and we know he is fighting with his heart and guts and that he will give us all his courage then we yell like hell for that guy to survive to fight again. And maybe in the case of Johnny people knew that for all the hard punching he was safest in the ring where he was only fighting other men and not something worse.